Bad news for those of you with small hands or small pockets (or both): It looks like phones are staying big for the foreseeable future. 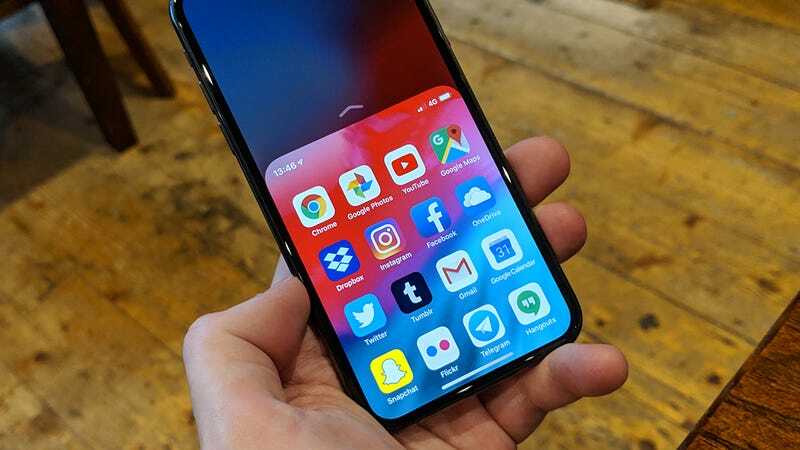 But owning a handset with a big screen doesn’t mean you can’t operate it with just one hand if you need to—these are the software tricks and apps you need to familiarize yourself with. Apple introduced a feature called Reachability into iOS back in 2014, and it’s been helping users hit menus and icons at the top of the screen ever since. It’s disabled by default in iOS 12, but can be switched on by tapping General then Accessibility in Settings and toggling the Reachability switch to On. With that done, a short swipe down or a quick swipe up and down near the bottom of the display brings the top half of the screen down so you can get to it more easily with one hand. On older iPhones, lightly tap twice on the Home button instead. Android doesn’t have an official mode like Reachability built into it, but some Android manufacturers have added one anyway. In the case of Samsung devices, for example, you need to choose One-handed mode from Advanced features in Settings. You get a choice of ways to launch the mode—either through a diagonal swipe up from a bottom corner or through three presses on the Home button. HTC is another company that’s put an easy-to-use one-handed mode right into its Android software. In this case, you need to choose Display & gestures and One-handed mode from the system Settings to enable the feature, then triple-tap the Home button to launch it. Both Android and iOS include a ‘one-handed mode’ for their respective stock keyboards. On Android, tap and hold on the comma button (lower right), then select the mode switch button (it’s the one on the right), then release. The keyboard snaps to one side of the screen—you can use the arrow button to switch sides, the pop out button (at the bottom) to move the keyboard anywhere you like on screen, and the expand button (at the top) to go back to the standard mode. Over on iOS, the equivalent one-handed mode is very similar. Here you need to press and hold on the emoji button (lower left, underneath the keyboard), then pick either of the one-handed modes on the left or right. Again, the keyboard snaps to the side of the screen, and you can use the arrow button to switch sides (or go back to the mode selection menu). To restore the keyboard to its full size, press and hold on the emoji button again then choose the full keyboard. One simple way to make a big phone easier to use with just one hand is to get everything you’re going to need down in one of the bottom corners of the screen. In the case of your home screens, for example, you can ensure all your favorite apps and shortcuts are within easy reach of your thumb. This is very straightforward on Android of course—you just tap and hold on a shortcut and then move it into position wherever you like. Drag an icon right down into the favorites bar to access it from the bottom of the screen (you might have to move another icon out of the favorites bar first). iOS is more restrictive in that you have to set up a uniform grid of icons. You can get your most-used apps and shortcuts down in the corners, but you’re going to have to fill the rest of the screen with other apps to keep the grid intact. Alternatively, try Makeovr as a workaround (open up the website on your iPhone): Using some smart invisible icon tricks, it creates the illusion of empty space on your home screens, which means you’re free to arrange your real icons as needed. For those apps you run a lot, check if there are any options to adjust the interface to make them easier to use with one hand. You might come away disappointed though—few of the apps that we’ve had a hunt through will let you tweak the layout in any meaningful way. One exception is Opera Touch, free for Android and iOS, a web browser built for simple and intuitive control with a single hand. There’s what Opera calls a Fast Action Button at the bottom of the interface, which you can press and hold to run searches, switch through your open tabs, and access various other features. If you’re on Android, you can take advantage of the experimental One-Handed Mode app from XDA Developers, which attempts to duplicate the functions of Reachability in iOS by shrinking down the screen so it’s easier to get at with one hand. It doesn’t work perfectly with every app but it’s worth checking out. Also for Android and also in an early beta form is Reachability Cursor, which is free in its basic form but has the option of a premium version. Here you get an on-screen cursor that’s within easy reach of your thumb, and which lets you control just about everything on your phone—from entering text to selecting options on menus—through a series of swipes on that cursor. Okay, this one’s a bit of a cheat—it’s actually operating your phone with no hands, and it’s not going to work in a hushed library or on a noisy commuter train. It will let you use your phone without cradling it in both hands though, so you might find it useful. The idea is simply to do whatever you need to do through Siri or Google Assistant: These apps can do a lot more than run web searches and pull weather information from the web, and perhaps more than you realize. We’re not going to run through a comprehensive list of Siri and Google Assistant commands here, but you can find some helpful pointers from Apple and Google online (or just ask for help). Both apps let you use your voice to open websites, turn Bluetooth and wifi on or off, set reminders, and bring up your calendars, for example. Both apps let you send messages and emails, and send and receive calls as well, saving you the trouble of having to stab at the screen to select contacts and type out text. Siri and Google Assistant are also capable of taking photos for you. Before you struggle trying to do something with your hands, see if you can do it with your voice.